A strategic marriage to a powerful Saracen lord with a penchant for virgins will enable wealthy Lady Jocelyn to keep her fortress home. But at what cost? Her only hope of escaping the depraved lord's harem is to lose her virginity—and fast! Captured and tortured knight Simon de Rhys is in no position to refuse Lady Jocelyn's proposition: his freedom for one night with her. The task seems simple, and deeply pleasurable, until he discovers her secret…. 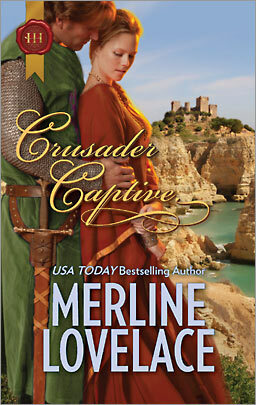 The author, Merline Lovelace, is one of those who writes in more than one genre (period setting). Who are some of your favorite authors who write in more than one? Post your answers and I'll pick a winner later in the week. Christina Dodd writes historical, contemporary and paranormal. Her historical books are among my favorite books. An author whose work I enjoy is Nora Roberts who's done everything from historical to paranormal to contemporary. Nora Roberts is definitely a favorite. Iris Johansen made a successful transition and I love her as well. Nora Roberts, Christina Dodd, and Julie Garwood! Lisa Kleypas, JR Ward(writes category romance as Jessica Bird) and Christina Dodd are some authors that write different genres that I love to read. For me it's Nora Roberts. The rest of my favorite authors stick to just one genre, which is great (not bad at all) because they're amazing at it. Three that come to mind are Lisa Kleypas, Fern Micheals, and Susan Wiggs.. oh Karen Hawkins...so that makes four..
Nora Roberts is the first to come to mind. La Nora, of course. Also, Denise Agnew, Jo Davis, Ann Aguirre, Karen Erickson, Lexxie Couper, and so many others! Jayne Ann Krentz/Amanda Quick/Jayne Castle for her books in, respectively, contemp, historical, and paranormal/futuristic. I am going to say Linda Sole who also writes under the names of Anne Herries, Emma Quincey, Lynn Granville and one as Juliana Linden. But I agree about Nora Roberts and Julie Garwoood. I'm sure there are so many more lol. Some of my favorites are Lisa Kleypas, Jayne Ann Krentz, Linda Howard and Nora Roberts.